After nine months off, Mad Dog has emerged this past week from what could well have been a permanent retirement. After arriving first to help out last year's injured visitor below Manics, he took a long break to sort through his feelings about the risks and rewards of what we do. It's a balancing act that is easily disrupted for many of us. 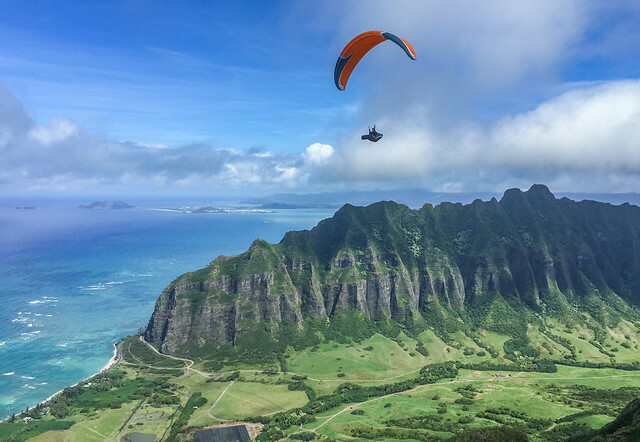 But now he's slowly and steadily getting back into it, starting with three fun flights at Kahana over the past week. Yesterday he joined me for a nice long loop between Hauula and the Hat under a low ceiling of gorgeous clouds. Here's to more great days flying fun and safe adventures with all our wingmen! Mahalo Alex, it is great to be back flying x/c with you & seeing all the monkeys again. I'm back for good! Wait I still miss him. Mad Dog please come out when I can play too.